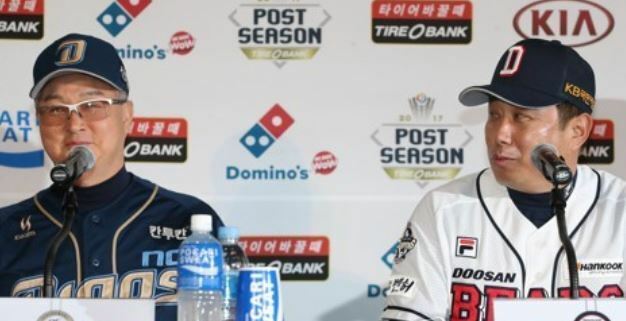 The Doosan Bears and the NC Dinos are colliding in their third straight Korea Baseball Organization postseason this week, but it isn't just the two ball clubs that will be renewing their rivalry. Managers for the respective clubs, Kim Tae-hyung for the Bears and Kim Kyung-moon for the Dinos, will also be going toe-to-toe for the third straight fall. Game 1 of their second round series, a best-of-five affair, is Tuesday. But the two skippers actually go further back. The two former catchers were teammates for the 1991 Bears, when the club was being operated by a different corporate sponsor, OB. And when these two squared off as managers in the postseason for the first time two years ago, the Bears released a photo of the two standing together in the 1991 official team yearbook -- with the older Kim wrapping his arm around the shoulder of the junior Kim, who wears a sheepish grin. It became an instant classic and a collector's item. This was Kim Kyung-moon's final KBO season and Kim Tae-hyung's second. It was their only season together as teammates, before they both worked as battery coaches in the Bears' organization -- the older Kim in the KBO and the younger one in the minor league. Then prior to the 2004 season, Kim Kyung-moon became the Bears' manager, and Kim Tae-hyung served as his battery coach. Kim Kyung-moon resigned in the middle of the 2011 season. The Bears went through two different managers before landing on Kim Tae-hyung in late 2014. Neither had a particularly memorable playing career, but both have enjoyed stellar managerial careers. The older Kim managed South Korea to the gold medal at the 2008 Beijing Olympics, and though he has yet to win a KBO title, this is his 10th postseason. Kim Tae-hyung won championships in each of his first two seasons as manager. And whenever he has an opportunity, the younger manager never forgets to credit his former teammate for inspiring him to greater heights. And Kim Tae-hyung reserves such a special place in his heart for Kim Kyung-moon that he shed tears over the losing manager after last year's Korean Series. "I've learned so much from him, and that's why I am where I am today," Kim Tae-hyung said immediately after clinching his second championship. "The Bears are such a strong team because Kim Kyung-moon developed so many good young players and laid the foundation that I inherited." On the eve of the clubs' opening game, Kim Tae-hyung said he still gets emotional when he hears the name of his former teammate and manager. But Kim Kyung-moon said he'll put aside personal feelings and try to get the ultimate prize. Kim has been the runner-up in the KBO four times without ever winning a title.